In iPhone SDK 4 Apple has removed all 3.x SDKs. I think that was not a very good idea to say the least. I can understand Apple wants developers to adopt the new features of iOS 4, but breaking zillions of Xcode projects is probably not a good way to win the hearts of those developers. Well, this is probably not Apple's goal anyway. This will get your projects compile and run again on both iOS 3 and 4. That's fine. Well, except when you want to make sure your project do not use any new iOS 4 only API. It's easier than you think to use a shiny new API without even noticing you are using something not available on iOS 3.﻿ This setURL:forKey: method is new in iOS 4 so this code will fail with an unrecognized selector exception when run on iOS 3﻿. Unfortunately, the only way to catch this kind of oversight﻿ is to run it on an iOS 3 device. Or you can read the documentation of every single method and function you are calling to make sure it was not introduced in iOS 4. But this does not seem very reasonable, does it? The tools should help us detecting these problems at compile time, not runtime! 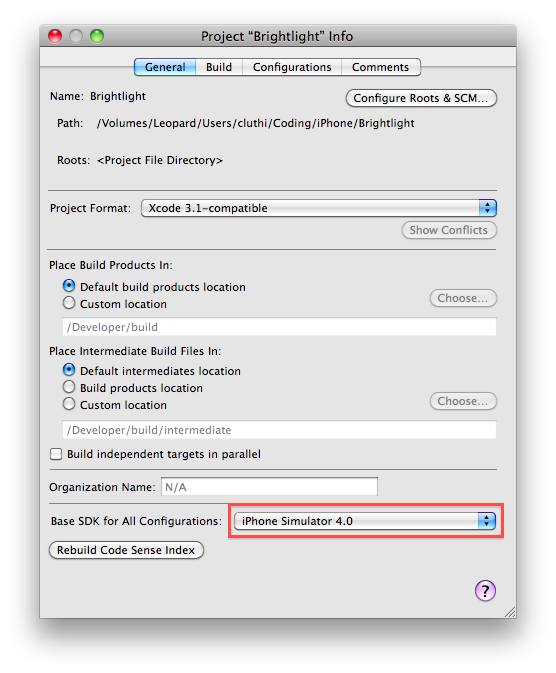 Here is how to get Xcode 3.2.3 and iPhone SDK 4﻿ working with SDK 3.1.3. Select GCC_OBJC_ABI_VERSION and choose Add Build Setting Condition from the gear pop-up button at the lower left of the window. There you go! 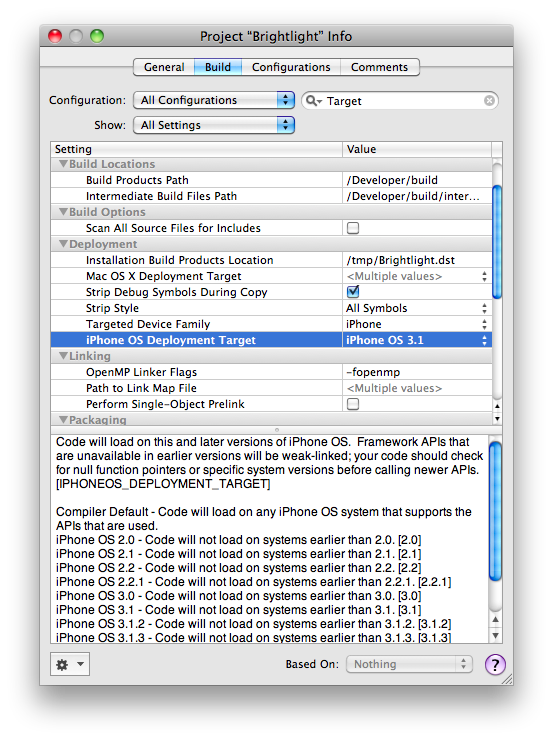 By selecting the SDK 3.1.3 Check configuration, you get compile time check for misusing iOS 4 only APIs when targeting iOS 3. Note that compiling with the iPhone Simulator 3.1.3 SDK ﻿and running in Xcode 3.2.3 simulator is not supported. 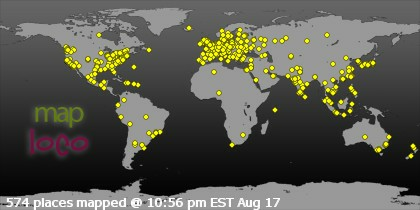 What you get with this hack is just a compile time check of the APIs you are using. So do not expect to run your app on a 3.1.3 simulator. Thanks for writing this up Cédric! - Select the user defined setting name in the left column, then select "Add Build Setting Condition" from the gear pop-up button at the lower left of the setting window. Cheers for that. If only Apple would be more helpful here. You can't think of a hack to actually *run* in the iPhone 3.1.3 Simulator? When I launch the iPhone 3.1.3 simulator from this 3.2.3 setup, I get an error from the simulator app stating it can't find the SDK with a "Switch SDK" button. If I pick the 3.1.3 SDK it still fails. I have also noticed that (at least with Xcode 3.2.3) you may also have to updated Base SDK in the build settings of your target. Thanks for the hard work Cédric! @Don I think you probably meant __IPHONE_OS_VERSION_MAX_ALLOWED. The short answer is it doesn't work properly. The long answer deserves a full blog post. Hi! This post would be extremely useful but unfortunately the download link is not working anymore. Does anybody know where I can download the SDK? @Anonymous Did you perform step 1, which is Log in to the iOS Dev Center? Yes I was logged in but it was just another very stupid error ;) Thx for the fast response and thx again for the great work. I have the iphone 3.1.3 SDK installed for Leopard with XCode 3.1.5 (I still have the installer for that). I'm trying to avoid doing another >3GB download. Can I modify your script to pick up stuff from the Leopard installer, and use the 3.1.3 SDK on Snow Leopard w XCode 3.2.x? I don't know if XCode 3.1/3.2 have different directory structures, or if the are other reasons to avoid trying this. Thanks for this post. I was considering doing a side by side install of an older version of the iPhone SDK and Xcode just so I could get compile time notification when using new APIs. Your approach allows me to do that with only on Xcode install. This is really good - thank you. However, I have not seen it mentioned that compilation produces many errors about synthesized ivars (I'm using Xcode 4.02 on 10.6.8). It seems to me these can/should be ignored in this exercise. Thank you for your post Cedric. Not related to this error, I mention that in the script I had changed the name of the 'dmg' file, as it is no longer the same... but I don't know what else to do. My OS is Snow Leopard. Is it any way I can debug the script so that I can isolate the issue? I resolved the issue: ...just learned that I had to use the command "sh myScrip.sh". Çok detaylı ile yazılan güzel. Ben sizin bilgi gerçekten takdir. Sizin ilham için teşekkür ederiz.